Making money online is not only possible, but it can also be very lucrative. There are many ways to proceed in this industry, but knowing what’s legitimate can be hard to figure out. By now, you have probably done some research online to discover what affiliate marketing is. And during your search, you’ve undoubtedly come across several training programs promising success. But which one is best? Which one should you choose? Are they scams? Specifically, is Affilorama a scam? Or is it a legitimate platform? It can be very overwhelming when you’re just starting out. It’s important to choose the right program if you want to be a successful marketer. Your education is by far the best investment you can make. I think you’re AWESOME for wanting to check out these systems before buying into them. You are wise with your money and want to make the right choice. I hope to give you the information you need, to make an educated decision, by the end of my review. And if you’d like to review the proven, honest, legitimate platform that I use, please CLICK HERE. 2 Who Is Affilorama For? Affilorama was founded in 2006 by Mark Ling and Simon Slade. Starting out with step-by-step video lessons, the program has grown to over 300,000 members worldwide. Originally, before the current changes in 2018, you had to pay $67 per month membership fees, with additional upsells once you started your training. Now, they’ve eliminated the membership fee and offer free introductory videos. The upsells are still available to proceed with your training to help you build your affiliate business. Overall, Affilorama guides you toward email marketing. This is a valid form of affiliate marketing but can become costly. When first creating your account, you have access to several courses to get you on your way. Mark refers to this book as a “bird’s eye view” roadmap for success. It gives you more in-depth information on how to find a profitable niche, attract and convert visitors, and create content that attracts links. This offers a 60-day money back guarantee. This product offers you a choice of five websites from his prechosen 18 niches. This is basically email marketing with landing pages. It offers the 60-day money back guarantee as well as a payout of $100 if you don’t make anything in 60 days following exactly as shown (must offer proof). This tool combines different resources to analyze your website. It’s currently in beta form and can track your traffic, sales, SEO, and your website’s health score. The forum is how you would ask any support questions, though can be slow and difficult to find answers. This system is for beginners who are looking to learn about email marketing. The free membership gives you a basic understanding of the processes involved to earn money in this industry. The lessons are basic, but give you a decent understanding of what you need to do to earn an income. The “Path to Passive” ebook goes more in-depth and will lay out a strategy for you. I believe the upsells are for those who don’t want to take the extra time to build their own businesses. These products, especially the AffilioJetpack, have some premade resources available for you. What you must also consider is the additional cost of services required to build these businesses. Especially with the AffilioJetPack. And nowhere does he talk about the cost of website domain names, a necessary cost before building any website. So even with the free membership, to act on what you’ve learned, you will need to expect considerable monthly costs to get up and running. Affilorama doesn’t offer any tools with the free membership. You must pay for the upsells to get at least some of them, such as his website builder with chosen theme, and 1 year of hosting. So you know in advance, I am only a free member. And by going through the free lessons, there was nothing new or useful to me. I don’t believe the upsells would be of any benefit either. But let’s look at what it might do for you, ok? Signing up for their free account is easy. And once inside, you have access to the free video lessons. Most of the videos are short and embedded in an article style lesson. I haven’t gone through all of the videos yet, but so far the longest was 20 minutes. As stated above, the free training is fairly basic. It gives a great overview of what’s entailed with affiliate marketing, but a beginner would require more in-depth training to truly understand the processes. There isn’t any chronological order to the free lessons. They cover most of the topics, but again, a beginner would need a properly ordered list of tasks to get from point A to Z. This is why the first upsell they recommend is the ebook “Pathway to Passive”. This will give the beginner more in-depth information about niches, creating content, optimizing a sales funnel, and creating backlinks. The information in this ebook is worth the $37, but again, I’m not convinced it can truly help a beginner create a passive income. A newbie should be walked, by the hand, through step by step training to really get going. They say this book would also help a marketer with experience. I suppose it might for some, but if you’ve been any kind of successful marketer, why would you need this book to begin with. It’s nothing new. AffilioBlueprint would be the minimum way Afillorama could offer a beginner the help they need to start. With the information learned from the ebook, this product provides the step by step lessons to get started. I am not a fan of high ticket items! The AffilioJetpack provides you with 5 websites. Personally, I think the price is ridiculously high for what you get. And working on 5 websites at a time isn’t easy or productive. Instead of working on one and building it up to success, you end up with 5 mediocre sites doing poorly. Affilorama has put together their own AffilioTools which gives you some interesting metrics. With the free membership, you can only enter one website. After that, you need to purchase a monthly website. A nice touch but really not necessary in my opinion. Did you know that Google Analytics gives you everything you need? For Free? Every new online marketer needs considerable support when starting a new business. This is the downfall of many entrepreneurs. If you try it alone, you’re bound to fail. Affilorama has a forum syle support system, which is typical of many online platforms. Unfortunately, they can be very frustrating. Especially if they aren’t active. When browsing through the forum, I noticed it wasn’t very busy. There were all of 12 members logged on at that time. Many member questions took anywhere from 1 day to a week to get answers. How on earth can a newbie proceed with their training when you have to wait for your answers. I guess I’m just spoiled, because the platform I use gives me immediate answers, LOL. If you are a complete beginner, then I would say go ahead and sign up for the free membership. The introductory video lessons can provide you with an overview of affiliate marketing, which is always helpful. Up until this year, Affilorama was known for outdated material which I would have advised staying away from. But looking through it all again, since the platform’s program changes, it seems as though most everything is updated. My first concern is their support of using PLR (Private Label Rights) articles in their content courses. Personally, I don’t support this. This is prewritten content that you, the buyer, have the right to publish it in your own name. The content is usually inferior, and the author will sell to anyone. So guess what? You run into the issue of duplicate content all over the web. This type of poor quality content, and most likely duplicated, will not please Google. It can potentially hurt your ranking. My second concern is the backlink training. In the past, Mark trained his members in what’s considered “black hat” strategies today. Without having purchased the upsells myself, I can’t say for sure what the new training looks like. Just be careful. Can I recommend something different to you? I would truly like to tell you about the platform I use, and I love it. Why? Because it works! This platform is close to reaching 1.5 million members. What does that tell you? It’s not only popular but keeps growing due to its success. And the best part is the free membership. 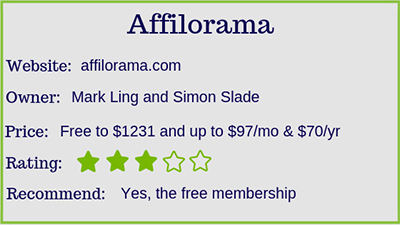 Yes, I know Affilorama offers one too, but this free membership has the same training and tools as the premium members, only slightly limited after seven days. The cost savings are worth it alone. No need for other service costs. Begin your new career with the best training platform. Click the picture below. Are you wanting to learn how to be an online marketer? I would love to hear from you. If you have any comments or questions, please leave them below and I’ll get back to you! And if you know anyone who would benefit from this post, please share! ← Travel Destinations For Retirees – Can I Afford To Go? What a nice post you wrote! I really enjoyed reading it and I could not be silent about your post so I decided to leave my comment here and say Thank You! For sharing this quality post with others. Actually, this is exactly the information that I was looking for about Affilorama and when I landed on your website and read this post, it answered all my questions in details. So I’m happy that you decided to write about this topic and share it with people. It’s very useful. I will come back to your website again for sure and I’m looking forward to reading your new posts. Thank you Ali, for your kind words. I’m glad you enjoyed the post. My desire is to be completely honest about my findings, in hopes of helping people make the best decision they can. And I’d be thrilled for you to return to my site. I fully endorse free programs. What I don’t do is pay a cent without checking it further. What I mean is join for free, then just unsubscribe if you want. So I have no issues with that. Some free programs are definitely a great value. If the program is good then you will most likely go for the full package anyways. Hi Sam, and thanks for your comment. Yes, free programs are always great! And some are definitely good value. You just have to be careful if they want your credit card information up front. I’ve seen too many people still be charged, even when they cancel. And it can be such a hassle to get your money back. I hope to show people what to expect when they join a program. Many aren’t transparent, and that frustrates me. I’ve never heard of this program and I think it’s commendable that you have taken the time to do an objective evaluation…and provide the reader with some pretty valuable information. It’s important to know what is available out there and how it works especially for those considering affiliate marketing. I’m not sure I could have the patience to go through the program just for a review, but it’s probably the only way to do a thorough review. Hi Christie and thanks for commenting! I’m glad you enjoyed my review. My goal is to inform all my readers about different make money platforms, so they can make an informed decision. I actually enjoy going through the programs to find out what they’re not upfront about. It’s not fair to people to not know everything before they join. I think you were more than fair with your review of the Affilorama Platform. You did not hesitate to point out it’s useful parts and suggest the value of using it to beginners. Then I love that you also introduced WA as the place to be and program you use. 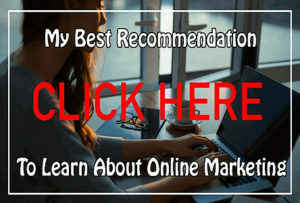 I have been a member since February, 2018 and I know for myself this is the best that I’ve been able to find to learn Affiliate Marketing and growing an online business. Hi Vanna, and thank you for your kind words. I agree that Wealthy Affiliate is the best place to be because it’s an all-inclusive platform for an amazing price. But I don’t want to take away any value that Affilorama offers. It’s just not as good as Wealthy Affiliate, haha. Even as a WA member, you can still access the free training with Affilorama to enhance your training. Glad you’re part of WA with us! Before joining Wealthy Affiliate, I sold 300 Chris Farrell Memberships. At that time, 5-10 years ago, CFM was a good affiliate training program and several of my recurring memberships continued for years! He used to engage with members all the time but he has become lazy in recent years and appears to have run his team down. Probably made enough? I agree Wealthy Affiliate is currently the best program and community! I have heard and read the same things. He’s no longer active in his community. Personally, I think he could be developing or involved in something new that’s currently more lucrative for him. It’s too bad though. It won’t do his reputation any good. And yes, his training is good, but I haven’t found anything more detailed and comprehensive than Wealthy Affiliate. Glad to have you as part of our community. Thanks for your review of Affilorama. I’m going to check it out and sign up for the free videos to see if I get anything more out of it. I am slightly put off by the expensive upsells because it sounds like many new marketers will get sucked in and keep forking out money to advance. After comparing the two, I definitely recommend Wealthy Affiliate as offering much better value for money. Hi Helen, and thanks for your comment. For sure, why not take advantage of what’s offered for free. You never know what little nuggets you’ll pick up. I agree about the upsells. They provide just enough generic training to get you hooked, then try to persuade you to purchase more in order to advance. What I find frustrating is that the first upsell (Affilioblueprint) tells you that you can succeed in using it. Then the second upsell (Affiliojetpack) tells you the first way won’t work, but that you should be using this new method to succeed. All a little shady to me, lol. I hope you take a look at Wealthy Affiliate. It’s all-inclusive and no upsells whatsoever. As a marketer I can appreciate this article. I do agree with the choices for the top affiliate programs. And your comparison between them is on point as well. I choose the Wealthy Affiliate Program. I’m happy you chose Wealthy Affiliate. You won’t be disappointed.